How often can you leave your house 1 hour before departure time and still have 10 minutes to sit at the gate and wait? That’s the beauty of Long Beach Airport for us. We left one hour prior to departure with our boarding passes already in hand. Security took 10 minutes (longest I’ve ever seen at LGB), and we were at the gate with plenty of time to spare. The terminal was a madhouse. I really can’t wait for them to build the new one. We boarded early and took our seats just behind the exit row. Unfortunately, only 10 of the 37 channels actually worked on the TV on this flight, but hey, 10 channels is still plenty to keep me entertained for an hour. That being said, the map is NOT one of those channels. Even with the upgrade to the new Google Map, it’s really pretty weak. You don’t get much info, there’s a ton of advertising on the channel, and the airplane is so big that it takes up half the state. See the picture at right to see the most useless map – the one that was zoomed way out. Fortunately, some were better than this but they still were lacking. Our flight was a perfect example of how crowded LA airspace is. They held us at the end of the runway for a couple minutes so they could space us properly with LAX flights. Then we departed and headed slightly northwest, holding at 9,000 ft in what felt like slow motion until we turned north over Malibu. Once around Simi Valley, we finally throttled up and climbed on our way to Oakland. The terminal was empty, and we walked all the way down to the JetBlue counters to print out our boarding passes from the kiosks. Then we walked all the way back to the entrance for security screening. (This is why I love common-use kiosks – they’re much more conveniently located.) Security was empty, and I sailed through. My fiancee, however, got stopped for some reason. They looked through her bag, found nothing, and she was on her way. Then we just waited in the terminal which seems to have every single eatery and shop under renovation right now. I’m not sure why, but our flight didn’t board until 15 minutes before departure. It had been sitting there for awhile, so that wasn’t the reason. The nearly full flight (the seat next to us was the only empty seat I saw) boarded very quickly, and the flight attendants thanked us for helping them get back on schedule. We pushed just about on time, maybe a couple minutes late. It was a beautifully clear weekend in the Bay Area, and we shot up into the sky for one of my favorite departure views. Just a few seconds after getting airborne, the pilot came on and said while he usually didn’t speak this early in the flight, we had received a gift. The controllers had granted our request for an aerial tour of the Bay Area before we headed on our way. I had done this once on an America West flight out of SFO but never out of Oakland. So, he leveled off at 3,000 ft and stayed around 220 kts (according to FlightAware) as we looped around the City. Unfortunately, I was on the right side so my views were primarily of the East Bay, Angel Island, and Marin. Up above you can see the view of the new Bay Bridge under construction. And below you can see Treasure Island. The old Pan Am flying boats used to come and go in the area at the bottom of the picture. Once our tour was through, we were on our way. I watched tv and enjoyed watching the vast Pacific out the window as we headed south. After the drinks had been served, a flight attendant came on and asked that everyone who had a soda can take the pull tab off and hand it to her. She personally collects the pull tabs to donate to her local Ronald McDonald House, and they apparently get a penny for each one they turn in. That was a really nice gesture, and apparently she does this all on her own. Another flight attendant said JetBlue had given her an award for it. We soon started descending. On my side, I could see glimpses of the Channel Islands and Catalina through the holes in the thin marine layer. We swung around and landed in LGB right on time, but only after touching down closer to the middle of the runway than the beginning. Glad they built that thing for long haul Douglas jets – there was plenty of room. Since we were in the back, we got off on the rear stairs and walked on the tarmac into the terminal and then straight to the curb. It was a great trip, highlighted by the ease of flying out of LGB. As much as I like trying other airlines when I can, it’s hard to justify doing that when JetBlue can fly me up to the Bay Area out of LGB. I’ll be back again soon. Nice trip report! Your blog is awesome! Have you ever flown Horizon Air to Santa Rosa? If you’re doing business in Napa Valley, would that be a good alternative? I keep reading the buzz that the Q-400 aircraft is really nice as well. Maybe that can be your next trip report? Thanks, Oliver. I haven’t flown Horizon Air nor have I been on the Q400. I do want to try that flight sometime, but unfortunately, it’s surprisingly far from Napa. The drive from Santa Rosa to the city of Napa is just about 50 miles, the same as driving from Oakland. True, you don’t have to deal with any bridges on that drive, but it’s on smaller roads than the freeway down to OAK. If you’re going to Sonoma, then STS is a great airport, but for Napa it’s just not that convenient and it’s more expensive with fewer flights. That being said, I do hope to try it out sometime. Brett, sounds like a nice trip. What is the deal with the TV channels? Is that a frequent occurence? Did you have any blue kool-aid on the flight? Wes – Dunno if that’s normal, but this did appear to be an older version of LiveTV. Our flight home was a newer version which meant quicker switching between channels and an updated graphic on the screen when the channels cut out. So, maybe this one just needs to be replaced. OAG – Um, did you read the trip report? There was plenty of blue kool-aid being passed around. We love jetBlue! It’s the little things that make them special (like the bay area fly over – who would think that with all the talk of gloom and doom that an airline would care to do that anymore for the pax?). They’re always the first choice if possible out of SAN. I’m so happy that Lufthansa got interested in JetBlue. I really hope that by the end of the year LH customer can collect miles on JetBlue. 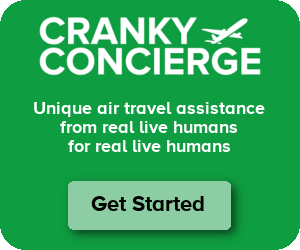 What an alternative to United or US Airways that would be. Excellent trip report. Shame I’ve never had the opportunity to fly Jet Blue, I really have heard nothing but good things – apart from the obvious “Trapped on the Runway” debacle back in 2007. I do have to wonder about the “70% organic” cookies though. I’ll have to look that one up! I took a JetBlue flight from Long Beach to Boston in 2005 and it was very pleasant. Now that I just moved to Long Beach, I hope to fly JetBlue more in the future, although they no longer serve my ancestral homeland of Columbus, Ohio. If ever flying around north of the border I highly suggest Westjet. Like Jetblue without the “trapped on the runway” media mess. I am not a terribly great flier, but I love to fly jetBlue. The service is amazing and its the only airline where I have ever had a pilot come out of the cockpit to say hi before the flight, “Hi, my name is Dave. I’ll be your pilot. We’ll be deicing the plane momentarily. It smells like syrup, but don’t worry, I’ve smelled it for years and I’m fine!” I was trying to find a good rate on jetBlue for a trip to CUN from SYR, but I couldn’t justify paying $300/person more then CO. But whenever I can, I am on jetBlue. I fly from Buffalo to New York City about once a week and always on jetBlue. Great airline although I wish they flew to Los Angeles out of Buffalo because I got there a lot too. JetBlue doesn’t fly anymore they JET!! I Jetted from JFK-LAS, PHX-JFK, JFK-BUR, & BUR-JFK in the past week and each jetting experience was excellent. I even got to JET in EML for FREE!!! I’ve flown on JetBlue before (flown, it was before this whole jetting thing.) and they’re simply one of my favorite airlines. I was even impressed with how they handled the aftermath of the plane stuck on the runway for 17 hours thing. Sure it sucked, but I’ve not seen that much honesty and putting the tail between the legs in quite some time. There’s a good question, Nicholas. When do you use “ramp” and when do you use “tarmac”? I’ve always used them interchangeably. Thanks for such an in depth trip report. I’m jetting on JetBlue for the first time next week (TPA-JFK & JFK-CLT) and you’ve gotten me excited! Hmm… The Boyd group people say its always a ramp.. Never having worked in the industry, I’m not sure what to say..